NEW from Bethel Music - "VICTORY"
Bethel Music’s latest album VICTORY features 14 confident, declarative songs recorded live at Bethel Church. 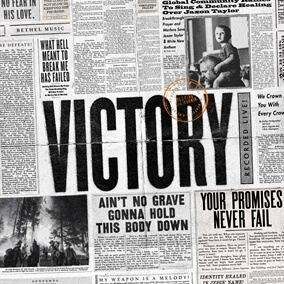 VICTORY offers a diverse sonic landscape, ranging from rustic, gritty tones in songs like “Ain’t No Grave” and “Stand in Your Love” to more anthemic, familiar sounds in songs like “Promises Never Fail” and “Victory is Yours”. With an unwavering confidence in the goodness of God, VICTORY invites listeners into greater faith, and ushers them through the doorway of breakthrough. Original Master MultiTracks, Charts, other worship-leading resources for VICTORY are now available.